The beautiful Marriott Courtyard Orlando Airport Hotel has been recently renovated to provide guests with an enhanced lodging experience. Surrounded by excellent shopping, dining, nightlife and famous sights, Marriott Courtyard Orlando Airport Hotel is the hotel to stay when visiting <?xml:namespace prefix = st1 />Orlando. Designed especially with business travelers in mind, this Marriott Airport Hotel in Orlando provides guests with outstanding services and facilities. 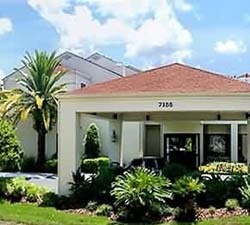 Luxurious and elegant accommodations await the guests at Marriott Courtyard Orlando Airport Hotel. Brand new guest rooms are overflowing with modern comforts enticing the guests. Many contemporary amenities such as cable / satellite television, coffee maker, iron, ironing board and hairdryer are included in the rooms of Marriott Courtyard Orlando Airport Hotel for the convenience of hotel patrons. The Courtyard Cafe serves breakfast for the hotel guests and countless fine restaurants such as Chili's, Denny's and TGI Friday's are also located near the hotel. At the end of a busy day guests can relax at the Marriott Courtyard Orlando Airport Hotel's outdoor heated pool or whirlpool. Exercise enthusiasts will be delighted with the Courtyard Fitness Center. Marriott Courtyard Orlando Airport Hotel provides hotel guests with 2 meeting rooms offering 1274 square feet of flexible meeting space. The business rooms contain audio-visual equipment and other equipment necessary to conduct a successful meeting. Many Orlando attractions such as Bok Tower Gardens, Charles Hosmer Morse Museum of American Art and Splendid China are located close to Marriott Courtyard Orlando Airport Hotel. Recent renovations to the Marriott Courtyard Orlando Airport Hotel have made significant improvements in the accommodation area. Comfortable bedding and modern amenities included in the rooms provide guests with everything needed for a comfortable stay. The Courtyard Cafe serves breakfast every morning. The hotel provides the following leisure facilities for the convenience of guests.